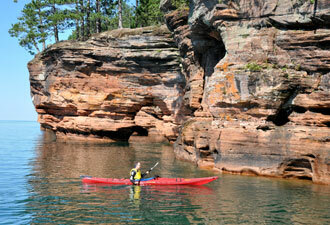 For a refreshing and exciting Apostle Islands getaway. Be sure to plan a trip that lasts more than just a day. How many Apostle Islands are there? We count 22. 21 are in the park, 12 miles of mainland too. There are two places on the mainland you can reach by car. One's just 13 miles from Bayfield, not so very far. There's a place to launch a boat and a dock where it can stay. It's a great place to watch the sunset at the end of a summer's day. Whether you like hiking or paddling, there's plenty there for each. Have carved out arches, natural bridges, and spectacular sea caves. Sea kayakers paddle through the caves when it's calm out on the lake. The Lakeshore Trail to the top is a fantastic hike to take. Go sailing, paddling, or cruising in a boat out on the water. Superior is the largest Great Lake by far, truly an inland sea. The Ojibwe have lived here for centuries and call it Gichi-gami. Several of the islands are pretty close to land. This includes the isles of Basswood, Oak, and Sand. But many of the islands are quite a bit off shore. Devils, Cat, and Outer are out there 15 miles or more. Six of the islands have light stations, more than any national park. They all still aid navigation, shining automatically after dark. The one most people visit is the Raspberry Island Light. Ranger Jim and Ranger Fred both lead tours there with delight. The lighthouse is still furnished like it was in 1920. 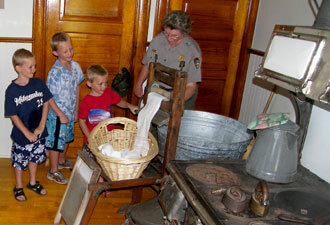 Guided tours of the keeper's quarters we guarantee will show you plenty. You can explore an old commercial fishing camp on the isle of Manitou. Though resources were harvested for years, it’s hard to see more than a trace. The forests have recovered, and the islands are again a wild place. This is even true on Stockton, the national lakeshore's largest isle. And there's lots to see and do there that can make any visitor smile. There's 15 miles of trails and more than 20 campsites too. And lots of wild berries that are red, and black, and blue. Colorful wildflowers, black bears, and birds upon the wing. Miles of beaches to walk on…and one with sands that sing. Remember that Bayfield is headquarters for the national lakeshore. It's the place to start your visit if you've not been here before. Now's the time to get busy planning so there's no regret today. 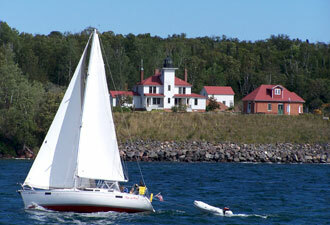 Check our website and get ready for an Apostle Islands getaway.